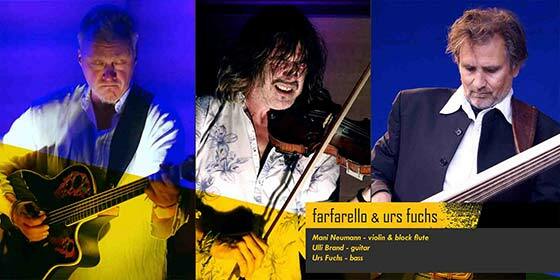 Violin, block flute, acoustic guitar on 6 & 12 strings, bass and percussion: that is farfarello!! 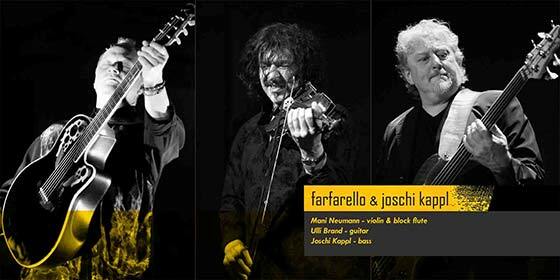 Mani Neumann (violin and block flute) and Ulli Brand (guitar), the founders of farfarello musical band, have over more than 30 years won European and international fame. Their musical style is so unique that any conventional presentation is almost impossible to make. 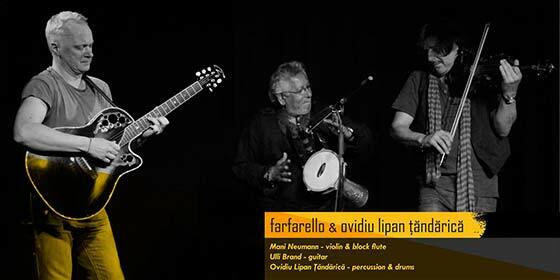 Through their music, farfarello create an archaic, rough, free of cliches sound, being a combination of East - European folklore and contemporary influences: traditional music, jazz, rock and classic music. 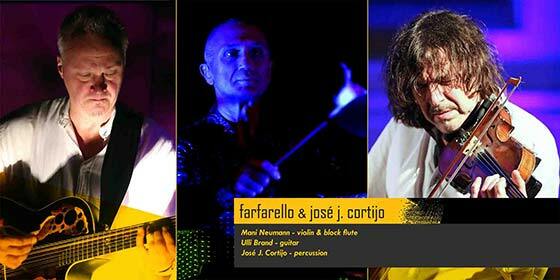 Since 1982 farfarello have released 18 albums, 4 dvds and have played 3500 concerts all over the world. 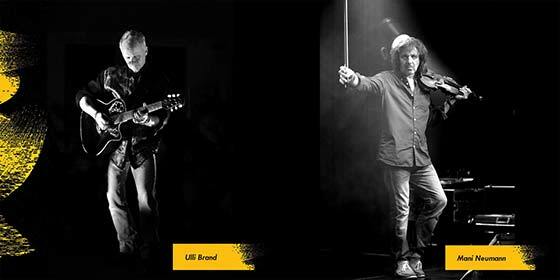 Mani Neumann and Ulli Brand brought to the scene, in different musical styles (trio, quartet, and even symphonic orchestras), great names like the famous drummers Mike Barsimanto and Herb Quick, or the singer Chris Thompson (Manfred Mann’s Earth Band) and many others. 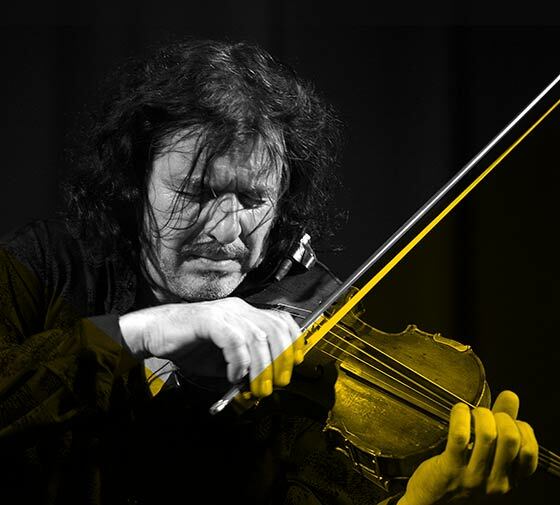 Mani Neumann, the German musician also called The Devil’s Violinist (Der Teufelsgeiger), is considered a master of violin and block flute. His style on the violin is explosive, unusual, and impossible to copy. Through his instrument he vibes with every step he takes. Whether melancholic or wild, exciting or impetuous – his playing is always authentic. In his career, he has been awarded MTV- Lifetime Award prize and was decorated by the President of Romania with the Knight order for outstanding cultural merits which he has brought to Romania as member of the legendary band “Phoenix”. 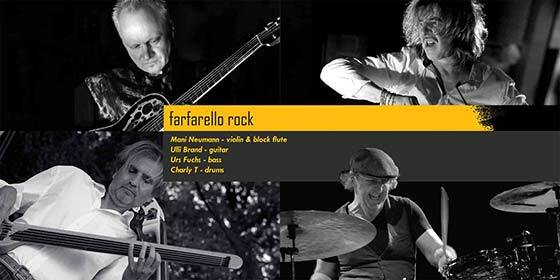 Since 1982 he has played with Ulli Brand under the name farfarello. 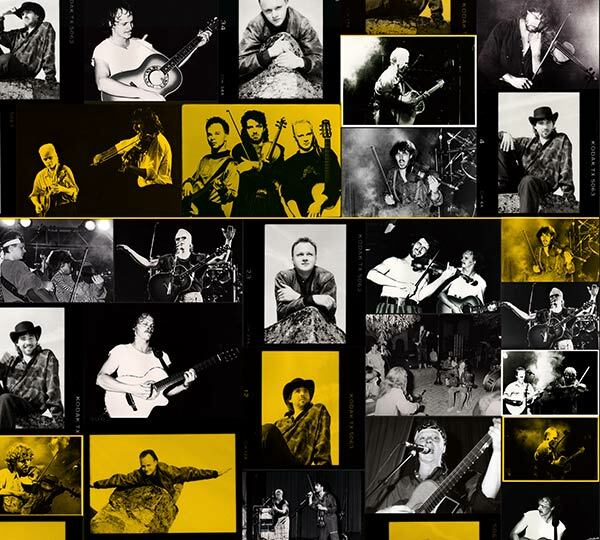 Ulli Brand is considered one of the best guitarists in Europe, being well-known for the unique way he plays the 6 & 12 string acoustic guitar. With skills and sensibility he merges the sounds of the acoustic guitar with different effects of polyphonic echo. Through this combination, Ulli makes the farfarello sound unique, authentic and original. Keeping the harmony and the bass with only one acoustic guitar, he succeeds in replacing an entire orchestra. The best example for this can be seen in his solo from the song “Durchzug“, where he gives the feeling that there are several guitar players on the stage and not only one. 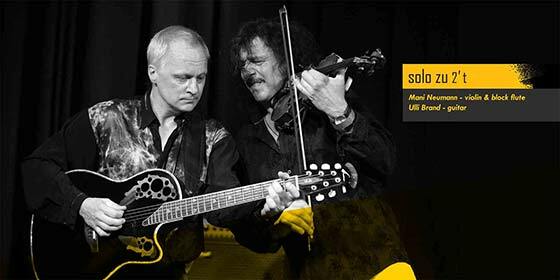 Other musical bands where Ulli plays are: Strinx – a guitar duo formed with Stefan Wiesbrock and “Aerotones” - a harmonica quartet, where he plays the guitar and harmonica. farfarello guests are very experienced musicians. Throughout the years Charly T. (drums) played with Belfegore, Eurythmics, Gianna Nannini, Marius Müller Westernhagen and “The Lords”. 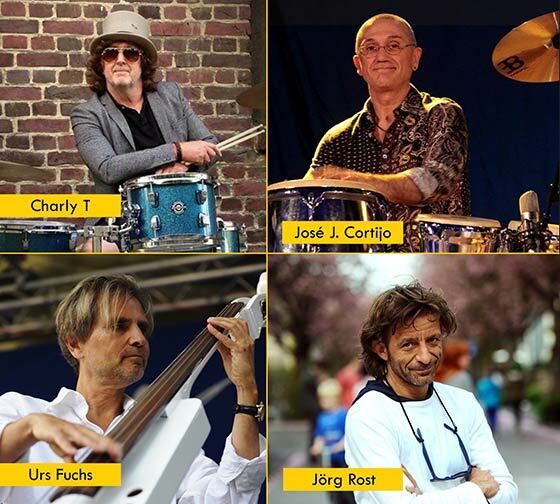 José J. Cortijo from Barcelona (percussion) has played with Nina Corti, Al Jarreau, Chris Thompson, Thomas Anders, Jon Lord, Peter Kraus, Uwe Ochsenknecht, Supremes and others. Urs Fuchs (bass), shares after a short break once again the stage with farfarello. Urs played with Jon Lord (Deep Purple), Sally Oldfield, Kathy Kelly, Frida (Abba), Miller Anderson (Spencer Davis Group), Charlie Mariano, Clannad, Peter Kraus and Wolfgang Niedecken. Jörg Rost is an unusual lighting artist who creates unique and overwhelming atmospheres with his creative illuminations of buildings and objects. His light creations and farfarello music give a melange whose fascination nobody can escape. To name only two of the projects where he works with the band: „farfarello in light“ & „Cherry Blossom Festival“. The famous Nippy Noya (percussion), first played on the scene when he was 10. Over the years he has recorded more than 200 discs with world famous musicians. He, played with John McLaughlin, Jan Akkerman, Billy Cobham, Chaka Khan and Andy Summers from Police. Marcin Wyrostek (accordion), is the most appreciated musician in Poland at this moment. He won the 2009 edition of „Poland's Got Talent“. He works with Tango Corazon Quintet and Coloriage. Marcin can be heard on farfarello's latest album „Glück“. 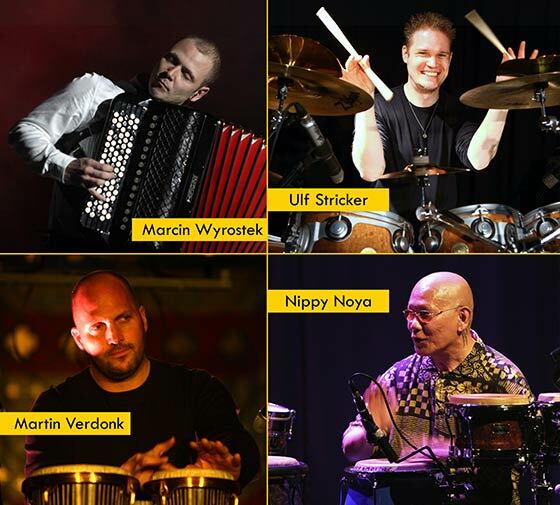 Martin Verdonk, another remarkable percussionist who collaborated with farfarello, worked also with Santana, Steve Winwood, Prince and can be heard with an outstanding percussion solo on the farfarello album „Unter dem Flüsterbogen“. Ulf Stricker (drums), is a first rate musician being highly appreciated in jazz, pop, rock, and world music. He played on the same scene with Bob Mintzer, Peter Weniger, Frank McComb, Stevie Woods, Dave Weckl, Thomas Lang, Gavin Harrison, Kirk Covington, Oboja Adu & Obonixx and many others. 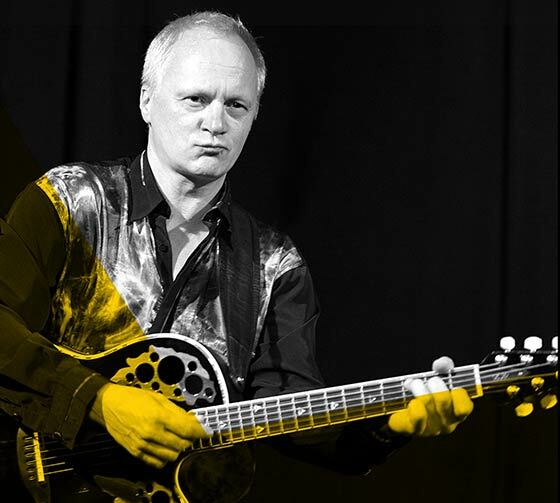 Joschi Kappl (bass), also called „The Big Blond“, has played with famous European rock bands like Heinz Rudolf Kunze, Lake or Phoenix, playing now in Pasărea Rock. His new project is "Meşterul Manole" a Rock Opera he created. 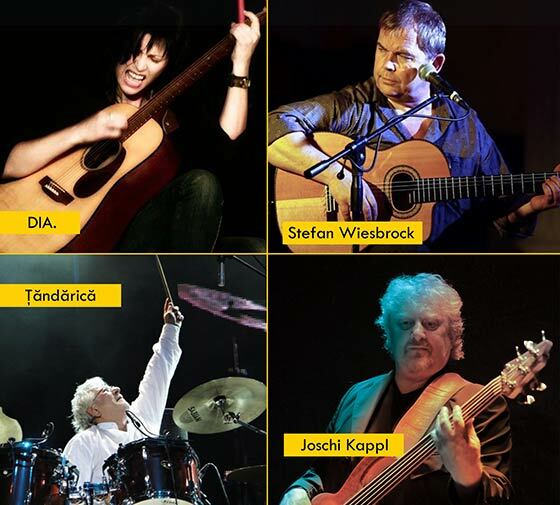 The virtuoso guitarist Stefan Wiesbrock accompanied farfarello many years since the production of the CD „Toys“. He also plays in the “Strinx” guitar duo together with Ulli Brand. Stefan focus now on his personal projects with Finger Food, Irish Stew or Meet the Beatles bands. DIA. 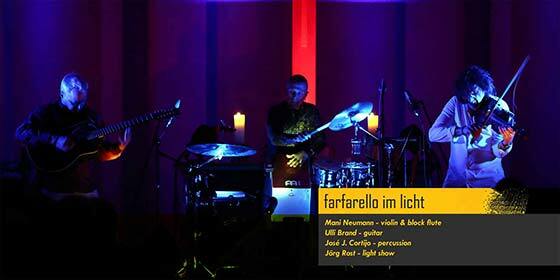 (voice/guitar) appeared on farfarello CD “Glück” with 4 vocal songs. She is an artists that dedicated herself to her solo career. Ovidiu Lipan Ţăndărică (drums), another famous name in Romanian music, is thought to be the best Romanian drummer ever. He distinguished himself with the famous Romanian rock band Phoenix. For his cultural activities he was awarded by the Romania President with the Knight order for outstanding cultural merits. “Ţ“ (his stage name) collaborated with Ginger Baker, Herman Rarebell (Scorpions), Joachim Witt, Gheorghe Zamfir and Grigore Leşe.